Moncks Corner Pediatrics was established in 1983 and has helped many children in Berkeley, Charleston, and Dorchester counties. 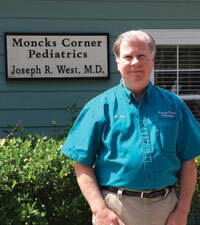 Dr. West is a native of Moncks Corner. He graduated from the College of Charleston and the Medical University of South Carolina. He is also a Fellow in the American Academy of Pediatrics and certified by the American Board of Pediatrics. Alex originally grew up in Charlotte, North Carolina. She graduated from the University of South Carolina with her Bachelors of Nursing degree and from the University of Birmingham, Alabama, with her Master’s in Nursing degree, specializing in Pediatrics Primary Care. Prior to working as a Pediatric Nurse Practitioner, Alex worked as a pediatric nurse at the MUSC Children’s Hospital in Pediatric Critical Care for over four years. She is certified by the Pediatric Nursing Certification Board and is a member of the National Association of Pediatric Nurse Practitioners. Alex and her husband Jack live in West Ashley with their family pets “Winston” and “Tucker.” She enjoys spending time traveling, creating unique crafts and baking delicious desserts. We participate in most insurance plans. We also participate in several Medicaid HMO plans. Please ask our staff any questions regarding your insurance. To assist us in filing your insurance/Medicaid for your visits, you must provide us with your current insurance or Medicaid information at the time of your visit or within 30 days. If this information is not provided to our office, the parent/guardian will be responsible for payment of the visits your child has received. We will also file for all hospital care we provide. Payment of your co-pay and deductible are due at the time of service unless prior arrangements have been made.